FM Alum Abbie Moore taught the fundamentals of basketball to the youth camp recently. PITSBURG – Thirty-four youngsters in grades 3rd through 8th attended Franklin Monroe’s (FM) youth basketball camp recently. The highlight of the camp were homemade awards made by the director herself, Abbie Moore. Moore is a brand new coach at FM this year. Last year she was the assistant girls coach at Arcanum. She played for the Jets in high school, and in her senior year helped lead her squad to the regional finals in 2008. She went on to play one year at Capital University in Columbus. Moore’s helpers at the camp were varsity and junior varsity players. 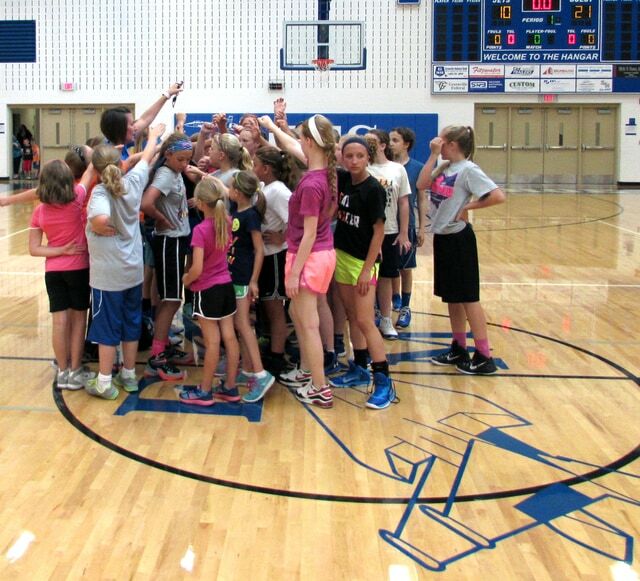 The campers worked on spot shooting, ball-handling along with offensive and defensive drills. The games they played were hot shot, dribble knockout and free-throw shooting. Moore said she would like to do the camp next year and hopes that more children attend. The camp is open to all Darke County students, she said.